An engineer’s creative instinct is one of his or her greatest assets and most powerful tools, but it’s not always readily accessible. When you’re under pressure to solve a complex problem or develop a new idea, you can’t lose time searching for a big break a nd coming up empty. 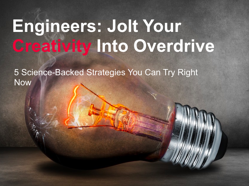 Learn new strategies to reignite your imagination and build upon your creative resource with this free resource for design engineers. Download the ebook to get started.